In horse racing, as in life, timing is everything. When we think of Pioneerof the Nile, it naturally is as the sire of Triple Crown winner American Pharoah. That is enough of a legacy for any horse. But if Pioneerof the Nile were a human athlete he would always have regrets - regrets of what might have been. Success, as impactful as it might be in the breeding shed, is not the same as success on the racetrack, where a Thoroughbred can use his or her God-given talents to thrill racing fans and leave everlasting images in their mind. If fans have a tendency to forget Pioneerof the Nile's heroics on the racetrack, it is because they were on a synthetic surface during the four years Santa Anita switched to a Pro-Ride surface...bad timing. If fans have a tendency to forget his second-place finish in the Kentucky Derby it is because for a fleeting moment it looked as if Bob Baffert was about to win his first Derby in seven years and the Zayat family, newcomers to the sport, were going to win their first Derby and make an immediate impact on the sport. It was right there for the taking; an eighth of a mile from Kentucky Derby immortality. But then from out of nowhere came the most shocking, incomprehensible, unexplainable move in Derby history that resulted in the most shocking, incomprehensible, unexplainable result in Derby history. From out of the gray foreboding clouds came 50-1 shot Mine That Bird to rip Pioneerof the Nile's name right out of the history books. Not only rip it, but tear it to shreds, just as it tore the Zayats' heart out...more bad timing. Pioneerof the Nile ran one more time, finishing far up the track in the Preakness Stakes, suffering a soft tissue injury that resulted in his retirement, after which he reopened the history books and stamped his name there for all time by siring the first Triple Crown winner in 37 years and one of the most beloved horses of our time. "Whether you have a concern about Pioneerof the Nile's inability to reach a triple-digit Beyer figure in his career or his relatively narrow margins of victory (his average margin is three-quarters of a length), the fact is, this colt is a winner. In some ways, he is reminiscent of Buckpasser, a stone closer who liked to beat you in the final furlong or even final sixteenth, never by big margins, but who was also undefeated in his eight starts in which he had the lead at the eighth pole. Buckpasser on occasion would inherit the lead too soon and would do just enough to hold off his opponents. On six of those occasions, his margin of victory was two lengths or less. "No one is putting Pioneerof the Nile in the same class as Buckpasser at this point in his career, but, like Buckpasser, he is flawless in his stride and determination. "In the Santa Anita Derby the pace scenario once again did not favor Pioneerof the Nile, who in his last four starts has been able to utilize his late stretch kick only once. His only flaw is his habit of loafing on the lead, and he deserves credit for winning the San Felipe and Santa Anita Derby despite having to run counterproductive to his best running style. That will not happen in the Kentucky Derby. "The son Empire Maker once again did just what he had to to maintain a length advantage to the wire. This horse is not going to dazzle you with big winning margins and track records, but because of that he will be going into the grueling Triple Crown relatively fresh, with his best races still to come. And as we said earlier, all he does is win. Scoring four consecutive graded stakes victories on the Derby trail is no easy task. And you can bet a month's salary that trainer Bob Baffert hasn't gotten anywhere near the bottom of him yet. Now that Baffert has booked his ticket back to his hallowed grounds, watch him knuckle down on this horse as the scent of roses grows stronger. "What is so pleasing to the eye about Pioneerof the Nile is his long, fluid stride and the way he hits the ground so effortlessly. Watching him on the head-on his legs are perfectly aligned under him and there is no wasted movement. He has proven he can beat you from anywhere, regardless of how the race unfolds. Wait until he gets to the Derby, where Garrett Gomez, or whoever rides him, is able to let him settle back in the pack and unleash the powerful late run we saw in the Robert B. Lewis Stakes." Earlier, after the Robert B. Lewis, I wrote, "From a visual and statistical standpoint, Pioneerof the Nile's victory in the Robert B. Lewis Stakes was as impressive as we've seen this year. Sure, there were more brilliant performances with outrageous speed figures, but the bottom line is, Pioneerof the Nile looked like a Kentucky Derby winner." And he still looked like a Kentucky Derby winner after training at Churchill Downs. As I wrote in my column, "Getting back to the Derby works, Pioneerof the Nile beat everyone on the track to steer clear of traffic, and he had the whole track to himself before the onslaught. It's difficult to state definitively that a horse will make a successful transition from synthetic to dirt, especially in the Derby, but if anyone has concerns about Pioneerof the Nile, it is safe to say that there is a good possibility he will actually be better on dirt than synthetic. You had to love the extension in his stride and the way he built up momentum coming through the final furlong. He was just floating over the ground and galloped out very strong, with an additional eighth in :13 1/5." And finally in my selections column I wrote: "Going by their potential odds, I would bet Pioneerof the Nile as my value horse, based on what I've observed over the past eight days. I have not seen a single negative, and you can't ask a horse to be doing any better. From a handicapping angle, he still has to answer the synthetic to dirt question, but he gets my vote for best work and overall physical appearance of any of the Derby horses. If he should win the Derby, then my colleague Jon White could be right; this horse is more than capable of sweeping the Triple Crown. 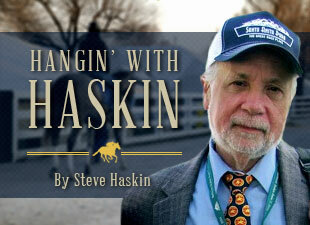 He meets my criteria of what it takes to accomplish racing's most difficult feat. But let's not get too far ahead of ourselves." Unfortunately, Pioneerof the Nile never got the chance to accomplish racing's most difficult feat. His dream ended at the eighth pole, jolted back to reality by arguably the most freakish performance in the history of the Kentucky Derby, and then by a career-ending injury in the Preakness. But Jon White and I really didn't get that far ahead of ourselves with that claim, as Triple Crown immortality awaited him after all. I remember going to visit Pioneerof the Nile the day before the 2015 Kentucky Derby. The Zayats had already paid a visit. When Pioneerof the Nile was brought out, Ahmed Zayat walked up to him and whispered in his ear, "Your son is going to do it for you." I wrote of my visit, "With all the hoopla at Churchill Downs, a vastly different scene was being played out about 60 miles away at WinStar Farm, as Pioneerof the Nile finished up his first of three breeding sessions for the day. Brought out of his stall, he stood for at least 10 minutes, staring into the breeding shed, ears pricked, and not moving a muscle. He coat had a bright gleam to it and he looked racing fit. "He's all class, said general manager Dave Hanley. "This is him. He never bites; he's just amazing. Look how well balanced he is." Hanley then had the horse walk to show off another of his attributes. "Now watch the way he moves," he continued. "He has that big walk. "Sounds like he might have also been describing a certain son of his, who the next day would be showing the world his class and how he moves." I visited Pioneerof the Nile one more time about a year ago and have wonderful memories and photographs of my wife petting him and photos she took of me petting him. He was not your typical stallion, And he still looked spectacular, as if he could start up training again. Pioneerof the Nile left us way too soon following a successful, but brief, racing career of what might have beens and a stud career that stamped him as one of the most sought after stallions in the country. Digging up my old columns, it brought his racing career back in focus and conjured up memories of a special horse who was on his way to stardom until history threw him a curve at the eighth pole of the Kentucky Derby. But he eventually hit that curve out of the ballpark. And for that he will always be remembered.